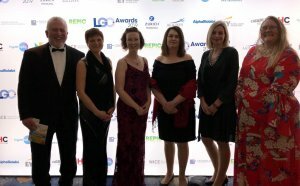 The Thrive Plymouth health inequalities initiative and the cross-sector collaborative partnership behind it was shortlisted for the Public Health award at the Local Government Chronicle (LGC) Awards 2019. This award was sponsored by NICE (the National Institute for Health and Care Excellence). Food Plymouth’s Ian Smith and Livewell Southwest’s Jan Potter joined Plymouth City Council cabinet member Councillor Sue McDonald and Plymouth City Council Public Health team members Ruth Harrell, Sarah Ogilvie and Claire Turbutt for the event, which was held at the Governor House Hotel, London. While Thrive Plymouth did not win the award on this occasion, it is wonderful to be recognised as a ‘premier division’ collaboration. Our partnership approach provides a firm foundation to do even better in the years ahead. Food Plymouth looks forward to continuing to play its full part in this.